"41CE12-190, Burial AH-17" by Timothy K. Perttula and Robert Z. Selden Jr.
DECORATION (INCLUDING MOTIF AND ELEMENTS WHEN APPARENT): The rim panel has single upper and lower horizontal engraved lines with either downward- or upward-pointing excised tick marks. 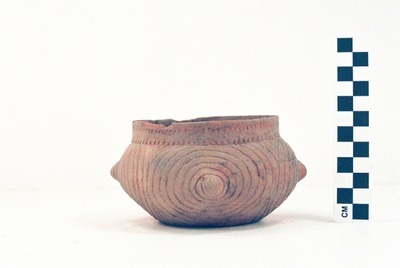 The vessel body has four sets of engraved concentric circles, and there is a large appliqued node at the center of each set of engraved circles. The sets of concentric circles are divided by large upper and lower pendant triangles, and each large pendant triangle has two inner triangular elements. Patton Engraved, var. unspecified globular bowl from the Jim P. Allen site.